Saint Matthew's Gospel: Brother Francis, M.I.C.M. You save $18.00 with this mp3 download. 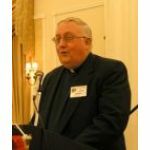 With the assistance of Father Feeney, Brother Francis had devoted over thirty years to the study of the Gospels before he gave classes on them. 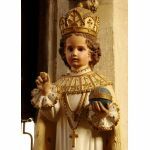 He actually memorized each of the four, and could recite Saint John's Gospel in Greek. The best way to get to know Our Lord, he insisted, is to contemplate Him as He is revealed to us in the Gospels. Only two of the twelve Apostles were inspired to write a Gospel: Saints Matthew and John. 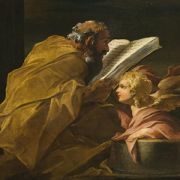 Saint Matthew had the conversion of the Jews most in mind in the writing of his Gospel, which is why he is the only writer among the New Testament authors to have written originally in Aramaic, the language spoken by the Galilean Jews. To convince the Jews that Jesus is the Messiah he provides an abundance of examples of Old Testament prophecies fulfilled in Christ. Beginning with the Savior's humanity, i.e., His genealogy from Abraham, and then introducing the Incarnation with the history of the birth of Jesus from the Virgin Mary and the adoration of the Magi, Matthew soon after includes three chapters on the Sermon on the Mount before proceeding to record more miracles and more parables than any of the other evangelists. One could say that Matthew moves his readers to see the divinity of the Messiah by first focusing on the uniqueness of His humanity. This is why the symbol of Matthew (his attribute in art taken from the prophetic vision of Ezechiel) is the face of a man. His is the longest of the Gospels and the first book to be written in the New Testament. Saint Matthew preached and was martyred (stabbed to death while saying Mass at the altar) in Ethiopia.